While chickpeas are arguably best known for being the star ingredient in hummus, they also offer a lot to promote weight loss and a healthy lifestyle. Chickpeas are packed with protein and fiber -- two nutrients that can help you shed pounds. To prevent diet boredom, think "outside the hummus" when you're serving chickpeas, and also try other diet-friendly chickpea dishes. Controlling your caloric intake is key for weight loss. To lose between 1 and 2 pounds of fat -- which is a safe rate of weight loss -- every day, you'll need to burn between 500 to 1,000 calories more than you eat. At 269 calories per cup, chickpeas are moderately high in calories. A 1-cup serving will take up 13 percent of your calorie "budget" if you're eating 2,000 calories a day. If you eat 1,500 calories, a cup of chickpeas will take up 18 percent of your daily caloric intake. However, your calorie investment nets you several essential vitamins and minerals. You'll get 71 percent of the daily value for folate, which is a B-complex vitamin your body uses to make healthy red blood cells, and you'll get smaller amounts of other B vitamins. 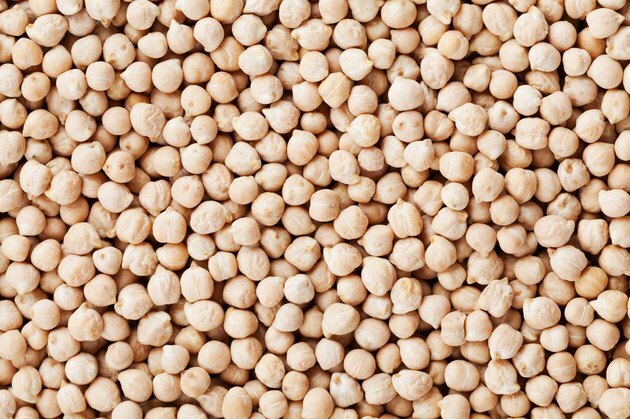 Each 1-cup serving of chickpeas contains more than 20 percent of the daily value for magnesium, iron, phosphorus and copper, plus 84 percent of the daily value for manganese, which is a mineral that boosts bone health. Chickpeas are also a great source of protein and dietary fiber, which are two nutrients that help with weight control. Each cup of chickpeas offers 15 grams of protein, plus 13 grams of dietary fiber, which is half of the daily value. Both protein and fiber boost satiety, so adding chickpeas to your meal helps ensure that you won't feel hungry soon after eating. And, thanks to their nutrient content, chickpeas can fit into a diet that's high in protein and fiber, which is effective for weight loss. A study from a 2011 issue of Nutrition Journal compared two weight-loss diets -- one high in protein and one high in carbohydrates and fiber. Researchers found that the high-protein diet was more effective for weight control than the high-carbohydrates-and-fiber diet. Study subjects following the high-protein plan lost not only more weight overall, they also shed more body fat and had lower blood pressure than subjects following the high-carb diet. Use chickpeas instead of meat to boost your fiber intake, and limit your saturated fat intake, which saves you calories. For example, add chickpeas to your salads instead of chopped ham, or enjoy chickpea burgers instead of hamburgers. Although there's no specific evidence that chickpeas themselves cause weight loss, some preliminary scientific evidence exists which suggests that pulses -- a small food group that includes chickpeas -- might help with a weight-loss diet. An initial study, published in Advances in Nutrition in 2010, found that people who ate pulses tended to feel more satisfied after their meals, which helped them lose weight during the three- to eight-week study. A review published in Obesity in 2014 analyzed the results of nine studies and found that eating pulses boosts satiety by 31 percent. So far, however, the research has involved small sample sizes and short time lines, and to get a better idea of how much pulses such as chickpeas actually help weight loss, longer-term and larger studies are needed. Serving chickpeas doesn't need to be complicated -- just drain and rinse canned, low-sodium chickpeas and add a handful to your salad or soup. Their mellow flavor means they'll work well in almost any dish, and their fullness-boosting benefits can turn a side salad or soup into a meal. If you want to get more creative, mix chickpeas with cooked quinoa, sautéed red bell pepper and zucchini, and top this with fresh mint and lemon juice for a bright and flavorful warm grain salad. Add a handful of chickpeas to your stir fries or include them in curries. A lower fat, hummus-like spread, made with pureed chickpeas, garlic, lemon juice and a little Greek yogurt, also offers a healthier alternative to fatty spreads -- such as mayo -- in wraps and sandwiches.